U.S.-Backed Forces Surround ISIS 'Capital' : The Two-Way It's a major step in the fight to push ISIS out of the Syrian city of Raqqa. The U.N. says there are up to 100,000 civilians still trapped in the city. 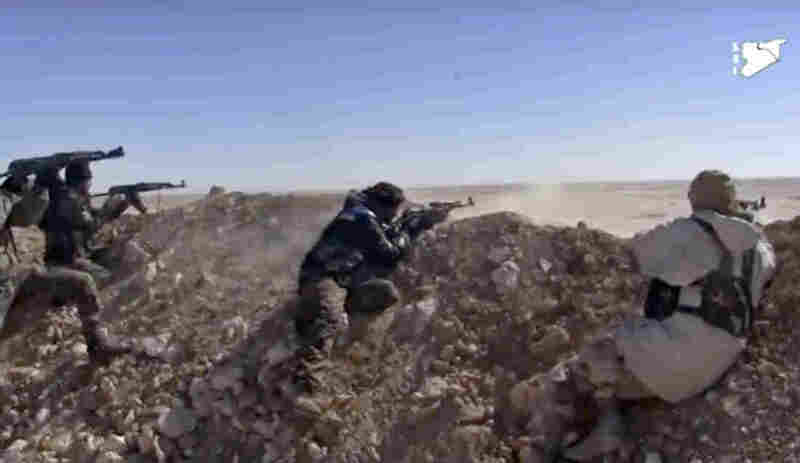 Syrian Democratic Forces fighters opening fire on an Islamic State group's position in March in the countryside east of Raqqa, Syria. U.S.-backed forces have surrounded the northern Syrian city of Raqqa, the Islamic State group's so-called capital, dealing a symbolic blow to the extremist group as it continues to lose territory. However, human rights advocates are sounding the alarm about civilians still inside the besieged city, which ISIS seized in 2014. U.N. human rights chief Zeid Ra'ad Al Hussein said Wednesday that "up to 100,000 civilians are effectively trapped as the air and ground offensive intensifies." The independent Britain-based Syrian Observatory for Human Rights reported today that the U.S.-backed Syrian Democratic Forces have completely encircled the city after making gains south of Raqqa. "IS has no other choice now but to surrender or fight to the end," Observatory director Rami Abdurrahman told The Associated Press. The Observatory added that Islamic State militants launched a counteroffensive later in the day in a different part of the city, resulting in intense fighting and casualties on both sides. Col. Ryan Dillon, a spokesman for the U.S.-led coalition against ISIS, said in a tweet that the SDF "now control all high speed avenues of approach into #Raqqah from the south." The SDF, which is made up of Kurdish and Arab troops, initially focused on the north, east and west of the city, as we reported. Dillon said the Islamic State fighters, "abandoned by their leadership, are being pressured by the #SDF from multiple axes around the city." Hussein, the U.N. rights chief, said that the U.N. has documented at least 173 civilians killed in Raqqa this month — and he believes the actual toll "may be much higher." "While some did manage to leave after paying large sums of money to smugglers, including smugglers affiliated with ISIL, reports continue to emerge of ISIL preventing civilians from fleeing. Those who attempt to flee also risk being killed by landmines or getting caught in the crossfire." He added: "Civilians must not be sacrificed for the sake of rapid military victories." It's not clear exactly how many ISIS fighters remain in the besieged city — the BBC reported that there were "up to 4,000" still there, while Col. Joe Scrocca from the U.S.-led coalition put the number at about 2,500, the Associated Press reported. The U.S.-backed troops have been fighting in nearby areas since November to try to isolate Raqqa. Earlier this month, they officially launched the operation to try to seize control of the city itself, aided by U.S.-led air support and military advisers. In an interview with Morning Edition earlier this month, Lt. Gen. Stephen Townsend, the commander of the operation against ISIS, said the coalition has destroyed all the bridges across the Euphrates River, which runs along the southern side of the city. "Unless you can swim or make a raft, it's really hard to get across the river in any significant numbers," he said. The commander stressed that the forces fighting ISIS are likely to face obstacles as they push into the ISIS-controlled city: "This is their capital, and they've had better than three years to prepare the defenses of the city."